I'm in Nepal just now, just passing through Kathmandu on my way to Bhutan. It's a 'family' trip this time - with my dad and brother, but I've brought my cameras along, hopefully to make some new images of the people of Bhutan while I am here. A very rare and special encounter in the UNESCO town of Baktapur in the Kathmandu valley yielded this image for me in 2009. I spent today going back to some old haunts. One in particular - the Boudha Stupa in the Tibetan area of Kathmandu was a special place for me back in 2009. So much has changed in the past six years for me since that trip that I couldn't help being a little reflective today about it. I found myself remembering who I was at that time, and what I was looking for as a photographer. I've always felt there is a great deal of value to be found in returning to a location more than once. In fact, many of the landscapes I have photographed, I have gotten to know over many years and by returning many times. Some offer up their secrets upon the first visit. I may find that the first encounter is so special that an impression remains indelibly marked on my psyche for many years to come and seems to be the benchmark for all further visits. Most of the time though, I feel that each visit allows me to learn a bit more about a place, and understand it better. I also find that each new encounter yields different images. The adage that you can't repeat what you did is often true, and going back somewhere to try to reproduce a certain look, mood or feeling just doesn't happen. You change. The location changes. And new things are brought forward as a result. A woman I encountered many times at Boudha Stupa in Kathmandu in 2009, but it took me about six days to work up the courage to get in close and make this photo of her. Being here today, I noticed that the Boudha Stupa has not changed, and it is still a remarkable site to encounter, particularly in the morning when it is covered in birds and all the local Tibetan's come to do their early morning prayers. But what has changed is that there are fewer Buddhists / Tibetans and Hindu's in traditional dress. In fact, the majority of the people I saw this time round were dressed in western style clothing. I am reminded today that the old pass away and the young replace them. The only thing constant in life it seems, is change. I didn't feel like making pictures today though, despite the Stupa being very beautiful, I felt I had more or less 'said it' back in 2009 and today has reminded me that what I managed to capture back then, was the product of about 12 mornings of repeated visits, hoping to find a new nugget that I had not been presented with on previous days. In short, what I got, was the product of hard work. I feel today that I've been given the rare gift of being allowed to appreciate my work in a new way. At the time of making these photographs I felt I could have done better. But returning today, I now see that the place is hard to photograph. The people who come here to pray do not wish to deal with a photographer asking them for images. The Boudha stupa at dawn. Many birds frequent the place in the morning during prayers. A more traditional dress sense was evident back in 2009, and seems to be more 'rare' now in 2015. But I also feel that I have no desire to photograph this place any more. I just feel I am content with what I got back in 2009 and there's no need to try and add to it. So if I have any specific point to make today, it is perhaps that returning to a location can sometimes make you reflect, and give you the opportunity to notice how you've changed as a photographer. I feel I am looking back at who I was in 2009 and noticing where I am now. Maybe some places need to be returned to only a few times. Like a special event in life, that one cannot repeat again, it's perhaps best to just remember it and cherish it for what it gave you at that moment in your photographic development. My original images of the Kathmandu valley mean more to me now, since I have returned. My shoot in 2009 was a special moment in my own photography-life and I'm grateful to have had the opportunity to reconnect with it and reflect on how hard I had worked to create it. 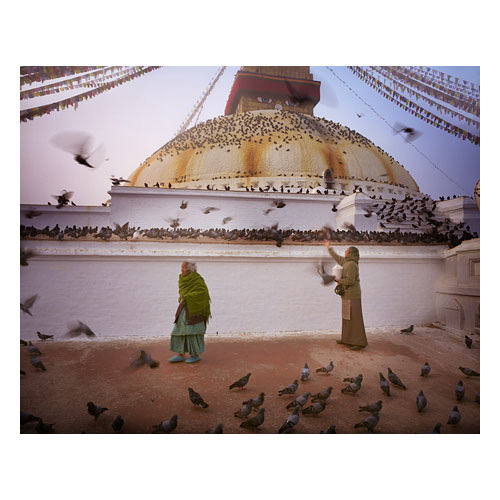 I'm pleased to tell you that I've put my Nepal portfolio on-line now. If I'm honest, I've not completed the Nepal collection of images, but I feel I have enough, more than enough, to share. I'm dreading the prospect of working on my India images because there are simply too many. I hope you enjoy the images from the Kathmandu valley. I felt very privileged to experience some amazing characters on my travels and there were a few golden moments in there to keep me satisfied as a photographer too. Nepal allowed me time to consider the impact of my approaches to photography - perhaps best described as my photographic-karma! This podcast covers my trip to the Kathmandu valley in Nepal earlier this year. I recorded a lot of audio source material while I was there. A few nights ago I was slowly (but surely) getting through my images of Nepal when I came upon this image. Photographed at the Bodnath Stupa in Boudha, Kathmandu, I'd completely forgotten about it until I gazed upon it this week. This was a 'defining' image for me on my trip - one of those where the experience of capturing it leaves a lasting impression on me, and I'm keen to see how it turns out when I get home. So when I gazed upon this image this week, I was taken right back to the moment I clicked the shutter. A woman was lighting some of the butter lamps inside the Bodnath Stupa. There is a little courtyard there with a small tent. It all looks rather precarious to me and it's not something I'd be happy to stand inside - a black tent with around 1,000 candles in close proximity to flammable walls, but that's just me. Regardless, I was standing on the outside of this tent looking in and noticed this scene. I was very discreet - the photographic interaction was quiet and quick and I doubt very much that she even noticed me taking her photograph. But what surprised me this week when I gazed upon this image after so many months is the little girl in the bottom part of the frame - who is being helped to light one of the butter lamps. I don't recall seeing her at the time of capture. Perhaps I've forgotten, but I just don't think I consciously registered that she was there when I shot this. Our minds are capable of clocking and mapping objects / people in our periphery vision and I'm often left to believe that photography entails subconcious, gut decisions that guide our concious minds. Following on again from yesterdays post about Bodnath Stupa, here is yet another perspective of the same location. You really don't have to keep traveling to different places each day to get something new. I simply just got up each morning and headed back to where I was the day before, and yet I always came back to my B&B with something new. I'd seen him praying on one of the platforms on the stupa, rather than from the ground level. I'd not seen anyone do this on previous days, so I couldn't help be attracted to the possibilities it presented. With the image above I wasn't trying to convey a sense of scale . I was really trying to put the Tibetan in a 'space'. Using Bodnath as a backdrop worked nicely because he's praying directly towards it. But now that I'm at my desk, several months down the line from the moment I shot this, I'm able to review what I shot and I feel that although I love this image, there are others which convey the sense of scale much more effectively. The sense of scale is much improved (I feel). The praying man is now a tiny object in the scheme of the main structure and it's clear that Bodnath is quite a dominant force in this setting. But now I've lost the close connection I felt with the praying man in the previous image. I'm less involved, more an onlooker than someone who is within the scene. And again, I spent another day roaming Bodnath Stupa, hoping to get a different perspective from my previous days. So it was with surprise when I realised I'd missed a small passage way which leads to an area for Tibetans to pray and do their prostrations. Prostrations are done to purify the body, speech and mind. There was an order or dicipline to how they run through their prayers each morning. I wanted to illustrate that yet I found it hard to find a vantage point where I could capture what I was seeing, until I saw this shot. It's one of those occasions where you have to blot out everything else around you to visualise it. Two figures, side by side facing a wall, the picture is about dress, it's also about stature. Well, these are the things I feel it's about. You may feel otherwise. I just remember having to stay for a while and try to time the shutter going off at the exact moment when one of the women would raise her hands. What's not apparent from this image is the constant movement they were both in - un-synchronised, it was a game of chance waiting for a moment when both women would be up from the boards, side by side, and doubly so to get one of them with their hands raised before the other continued downward with her prostrations. Sometimes, you don't have to go too far to find new images. Ok, I admit, I'd traveled all the way to Nepal in the first place, but the point I'm making is that once you're at your destination, you don't need to keep moving every day to get new images. I found the Bodhua stupa a really interesting place to photograph. Yet it felt like each day I was looking for hens teeth. A difficult place to photograph because the Tibetans who live here are constantly on the move, cicumnavigating the Stupa each morning and evening, and for the rest of the time, the place was almost deserted. Yet it was a captivating place and although I came back to my bed and breakfast each morning (after getting up at 5am) with small pickings, I felt that going back, morning after morning was producing a collection of images. Sure it was slow and it was hard work most of the time too. But repeatedly going back made all the difference. There's a difference in attitude and process to photographing people compared to photographing landscapes. But there are similarities too. As much as we say that people are unpredictable and that we don't know the outcome of the interaction, the same can be said of landscapes too. We tend to think that landscapes are static, unchanging, but I've had my fair share of unpredictable weather conditions and many images that have 'got away from me' for reasons I had no control over - usually weather / light related. But I think making images of people is very similar to making images of landscapes from an asthetic point of view. Take the picture of the old lady above. I think I was attracted to the image of her because of the complimentary colours. I'm sure that this attraction is similar when making photographs of landscapes - we're not simply attracted by the compositional aspects or the subject matter alone: we're attracted by the bringing together of colour, shape, form, light. Many aspects which I feel are the same for people images. Using a traditional darkroom is a revelation for me. I've spent the last four days in a darkroom with developer, stop bath and fixer making contact prints from my Indian and Nepal images that I shot earlier this year. What I didn't expect was to fall in love with the black and white photographic print. I also didn't expect to have my head turned from thinking about images in colour and appreciating them in their monochromatic form. Take this image for example. Firstly, I can't even specifically remember shooting it, which is a revelation in it's own right as I often have the most memorable images imprinted in my mind when I come home. So it was great to discover this little treasure. It was shot in a UNESCO heritage site called Baktapur, which is in the Kathmandu valley, perhaps an hour away from central Kathmandu. I love the composition although it's flawed in some ways. I'd have liked to have had the silver jug at the bottom of the frame removed, or burned in so much that it's less distracting, but that's not easy in something like Photoshop without really screwing up the image. But I'm not too precious. It's the girls pose that works for me, combined with her dress. It's rather candid yet I was standing a few feet away from her, down at her level. I'm a bit foreward at times, not in a demaning way - i'm quite discreet and will just find myself in the middle of the action while in this case there was preparation for some festival going on. I have to get in close.... that's the only way to get decent impact or presence. Ah but then again, as much as I loved the shot in colour, it was really something else to make a black and white print of it on Monday. There's something lovely in the texture of the girls dress that draws me in. The above image is just a desaturated version of the file above - I don't have the means to reproduce a real black and white print here, but suffice to say that it has a quality and impact that's hard to convey. Regardless of this small issue, I feel the image has now transformed into something else. It has an 'old world' element to it, and I bet that most folks would think it was shot a few decades ago at the very least or perhaps early last century. Which do you prefer, if you discount my own feelings on the matter? I love both (naturally, I have that invested emotional connection with my own images). This is a portrait I shot using my newest toy, a Contax 645 system with a standard lens. Notice the shallow depth of field? It was intentional, but perhaps it's too much. I'm not that precious about things and I'm very happy with the image. But perhaps next time I'll ease off with using f2 and shoot at f4 instead, or perhaps I'll shoot both? There's a softness there and a glow which I feel is only possible with film. Certainly not achievable with a digital 35mm slr system anyway, to my eye at least. It's purely personal of course and you may feel differently and also have proof to back up your alternative view point? If so - I'd love to hear from you. I've been too busy of late. Far too busy to process and work on my images from Nepal and India, and in three days from now, I'm on a plane again, this time headed for Patagonia and Bolivia. I've got three film systems with me. Two systems I know really well - a Mamiya 7 and an Eos 1V. Why 35mm you might ask? Well, because on reflection, it seems that 35mm 'looks' better to my eye than digital does, and it has a flexibility to it that is not apparent in the larger systems. I spent a good week up north on the isle of Eigg (ground work for an upcoming workshop I'm doing there in September - check out my workshop page if you want to come along), and had the most wonderful weather. Lots of snow capped mountains so I'd like to post you some in the coming days - time permitting. I'm just heading off for the highlands, but before I go, I thought I'd post this image. I shot this in Baktapur, a village on the outskirts of the Kathmandu Valley. There are a lot of Hindus in Nepal and on this occasion there was a little ceremony going on. I'd been out shooting in the early hours of the morning in the daily Kathmandu valley fog, when I kept on noticing small girls being escorted through the town all dressed up. But it was all elusive - the shot I wanted to get. So I let it pass. Then around midday I came across a little building where there seemed to be something going on. Upon entering the courtyard, I could see lines of girls all dressed up, with doting mothers keen to have them get more attention than the others. I'd like to say I knew what was going on, or that I understand the Hindu culture. Is she a living Goddess perhaps? (they appoint a girl every now and then to be a living goddess), I do not know. But it was the perfect opportunity to make some images and this was certainly one of them that when I clicked the shutter - I knew I had a nice composition. It was shot with a Contax 645 and standard lens. The lens was focused as physically close as possible. The film was Kodak Portra, which I love for it's warm tones. I don't think the image is finished yet. It's my first scan from the Contax and I'm really pleased with it. I found this camera really nice for portraiture work and now I'd like to find out if it's ideal for landscape work too. Each camera system has its strengths and weaknesses. As much as I love my Mamiya 7, it's not really ideal for portraiture work, or in particular - getting in close. I don't like to advocate the promotion of camera gear, simply because I feel there is too much of it. I've lived and worked with my Mamiya 7 for 8 years and I know it's flaws and I also know where I want to be going with my own photography. You can only reach that by building your experience and learning to work and get the most out of your existing systems. It's all too easy to just keep buying more gear, but on the other side of the coin, when you know you have limitations in your system, then it's time to find that missing something. I feel the Contax may be it. Well I'm back from India and Nepal, as of yesterday and apart from feeling the jet lag, it is now only possible for me to really understand where I have been and what I have seen. You see, I feel like a chameleon when I go traveling. Things are fresh and new.... for a while and quickly what was special becomes my new norm. My normal point of reference. Home starts to feel like a dream and I'm quickly immersed in my new surroundings so much so that I loose a sense of perspective. It is only once I am home and have adjusted to my cultural background that I am able to take stock of how culturally rich and strange the places I have been to are. I met up with David DuChemin from the PixelatedImage whilst in Kathmandu. I was unfortunately fatigued and unwell, but we had a good chat about photography and it was really nice to meet him in person. I feel that David is someone we will be seeing a lot of in the future. He has drive and vision. So I now have 99 rolls of film (I counted them this morning at 3am) to get processed. What can I tell you of the trip? Or the photos in particular? Well I think India was overwhelming in so many ways and I often felt that I needed to escape. Noise noise noise. People people people. Portraits portraits portraits. Yes, I think I'll perhaps have a new portfolio titled 'portraits of Rathjestan' but also a portfolio dedicated to the Taj Mahal. I fell in love when I least expected to. Arriving at the Taj gates at 5am for sunrise to find I was one of a few thousand sunrise visitors, I felt that I would get nothing, and perhaps I should resign my camera to my bag. But the building was simply stunning and I'm not usually one for the normal tourist adverts. I'm unclear at this moment whether it was the Agra smog, eating away at the marble of the building and shrouding it in a ghostly fog that made it more special, or if it was simply a case of enjoying something with symmetry and order after three weeks of dust, dirt, grime, poverty you wouldn't believe and maddening chaos. Perhaps this did enhance my response to the vision of the Taj, but I went back three mornings to shoot there and now feel convinced that in those unprocessed films, I have the germs of a seperate portfolio. I guess I love that about film. I slowly build up a mental picture, or perhaps more an emotional picture in my head of what the final results will be like. I often get a feeling when an image comes 'right' in the camera. Often at the point of tripping the shutter, and yet, nothing ever prepares me for the processed images when they land on my desk. So what now? Well, apart from some sleep, and some decent food for a change, I need to get prepared for a workshop I am doing in Patagonia in around six weeks time. I'm also going to do the full Paine circuit while there - something I have yet to do in an attempt to get some photos from the highest pass in the park - the John Gardiner pass, which has panoramic views over the southern ice field (wish me luck). But I also have a trip to Easter Island and this is really what the title of this post is all about. I've been to Easter Island before - around six years ago and I came home spell bound by the place. I knew then that I had only scratched the surface of the Island and I've had an itch to go back for a long time. I do feel that you often need to repeat a visit to a location. It's not always immediately 'understood' and it can take time to truly understand a landscape to get the best out of it. So I hope that this trip to Easter Island allows me to peel perhaps one or two layers away. I'll sign off just now. Off to make a cup of tea and get those films processed. Expect to see some blog activity in the coming weeks regarding my Indian and Nepal photos.